This past weekend my local co-op was demoing this salad, so I thought I’d try my hand at making it. I love salads made with citrus so that part was easy, but I had never used pomegranates in anything before even though I do love them in things. It just looked too daunting to me to get those seeds out of the fruit. But the produce person at the co-op told me about doing this in a bowl of water, same as recommended by the Joy of Cooking. Here’s a fun video demonstration of the method. It worked great. I squeezed (by hand) the juice out of half the seeds to use in the salad dressing and used the remainder on the salad. If your local supermarket doesn’t carry Satsumas, use Clementines or regular oranges in this salad, as long as the citrus you use is sweet rather than tart. It’s been fun to learn about new (to me) fruits this year. First persimmons, now pomegranates. What next?!! Whisk all together till slightly emulsified. Wash and dry the lettuces. Place in a bowl and toss with half the dressing. Turn onto a platter. 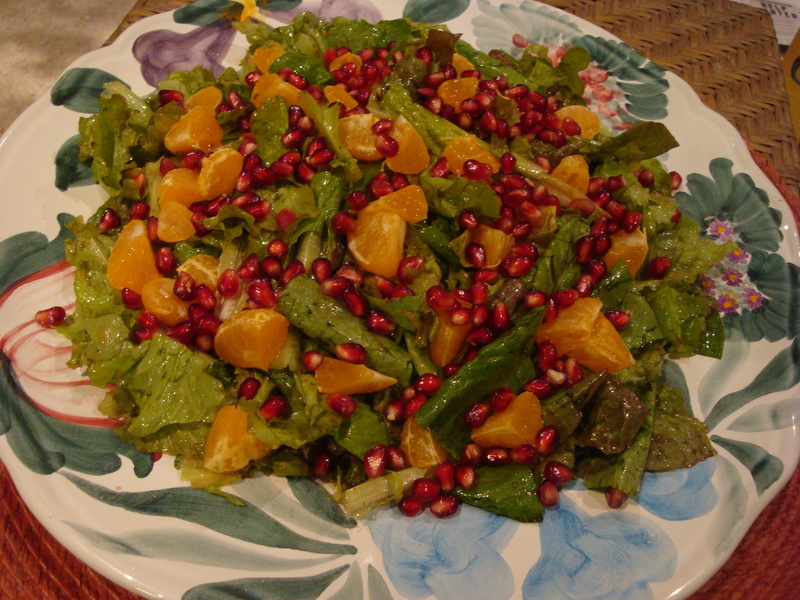 Place the orange pieces on top of the salad and sprinkle with the pomegranate seeds. Drizzle the other half of the dressing over all.